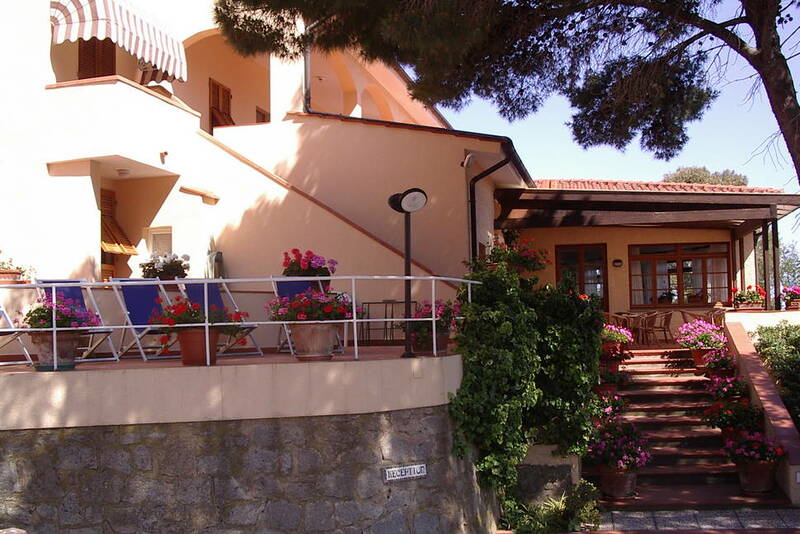 The family-run “Le Briciole” Bed & Breakfast Hotel, at Redinoce on Elba's west coast, enjoys a superb view of the sea. Its unique position, at the foot of Monte Perone overlooking the coastline running from Procchio to Marciana Marina, gives “Le Briciole” a wonderful panorama. The gaze is inevitably drawn to the crystal-clear sea – given a thousand iridescent shades from green to blue by the sunlight – and the unmistakable outline of the “Paolina” cove and nearby island, where tradition has it that Napoleon’s sister used to bathe well away from prying eyes. The view extends along a succession of inlets and coves, on to the gulfs of Procchio and Capo Enfola, suspended between sea and sky on the horizon. Behind the hotel, the rich woodland vegetation gradually gives way, as it reaches the coast with its shear drop to the sea, to pine trees and shoreline plants. The flower-lined steps leading to the hotel’s reception area are the ideal introduction to a dimension very different from the tourism standard. The location, the natural surroundings and the genuine, friendly hospitality enable every guest to regain a sense of control and proportion, well away from the pace and problems of daily life. 3.5 km from the picturesque seaside village of Marciana Marina, a favourite with holiday-makers, "Le Briciole" has 16 air-conditioned rooms, standard or with sea view terrace, all with en-suite facilities, hair-dryer, direct dial telephone, LCD digital TV, minibar and safe. The amenities offered include a private car-park with shade roof, TV lounge and bar. WI-VI is available in all areas an dd is free of charge. The daily price of the room includes an umbrella and two loungers on the private beach with facilities and snack-bar 400 metres from the hotel. The buffet breakfast is served in the large room with a fine view over the gulf of Procchio. Ideal for lovers of sports and the outdoors, the hotel is recommended by Parks.it, the Italian Parks portal. No pets, even of small size, are admitted. The Hotel is on the coast road between two villages, 4 km. from Marciana Marina, and 3 km. from Procchio. You are advised to bring your own vehicle.